Chelsea and Jose Mourinho prepare for their first game during “The Second Coming” a young and very talented squad is at the disposal of Mourinho. A squad that has the potential to play in various formations due to the versatility of the players and the temptation to overload the side with as many soon to be superstars as possible. Last season Chelsea would line up in a 4-2-3-1 in an almost guaranteed fashion in the same way Mike Bassett claimed England would be playing “4-4-F%#!*ng-2”. Whilst there is nothing wrong with that, a lack of plan ‘b’ and a seeming refusal by both Di Matteo and Benitez during the campaign to drift away from the formation meant a relatively predictable attack at times. During the pre-season last year Di Matteo didn’t experiment with another system and made implementing one during the regular season all the more unlikely. 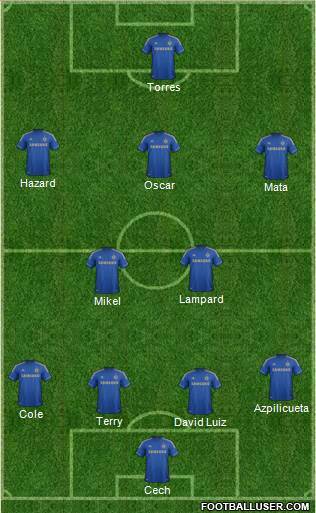 Speculation is already mounting whether Chelsea will line up in a 4-2-3-1 or revert to the 4-3-3 that brought so much success when Mourinho first came to Stamford Bridge. Potentially Mourinho’s biggest dilemma is what to do with Oscar, that decision may well be the key factor as to which formation the team adopt. There has been much debate about what will happen to the Brazilian under Mourinho, some seeing him the perfect option deeper in midfield playing the role of ‘Regista’ (assuming Mourinho maintains the 4-2-3-1) the position made fashionable by the likes of Andrea Pirlo and Xabi Alonso. Pushing Oscar further behind adds depth to what was a depleted central midfield last season. Essien, Lampard and Mikel who will also be vying for one of the two spots (along with Ramires) have a physically obvious flaw in that they never have or they no longer possess any great speed and have been found guilty of being a little flat footed at times during opposition counter attacks. Oscar’s youth and speed make him a perfect candidate for the role, however whilst he undoubtedly has the passing ability, positional intelligence and a willingness to defend it would almost be a sin to deprive Brazil’s playmaker a more advanced role that he enjoys with his national team. That role was however, under Benitez, occupied by Juan Mata and many feel the Spaniard is the better suited to the central role of the three in behind the striker. The likely scenario is that one of the two will end up in a wider position and the interchanging merry-go-round will commence once again but there are notable factors as to why Oscar is the more suitable to play centrally and one of the major ones is the fact that Juan Mata’s productivity under Di Matteo in which he would usually start from the right hand side was equally as effective, if not more fruitful than his time in the middle under Benitez. The other factor is Oscar’s defensive capabilities and desire to hassle opposition midfielders who are generally given a free licence to roam and pick up the ball without much fuss when Juan Mata is the central of the figures. This may not appear to be all that important but forcing a loose pass or a mistimed control deep in opposition territory can provide Chelsea with countless more chances on a quick break. 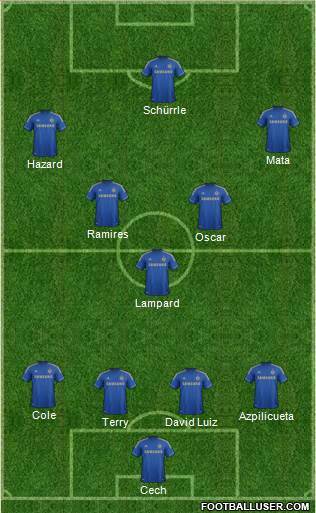 The other option that Mourinho may opt to take regarding Oscar is if he decides to play a 4-3-3 and use the Brazilian in the same way Toni Kroos is used at Bayern and similar in theory to how Frank Lampard operated under Mourinho albeit the pair are very different players. Oscar in defensive transitions would be tasked with dropping deep to create a bank of three ahead of the defence and be the link between the midfield and attack when in possession of the ball. A notable issue last season was the number of occasions the distance between the central midfield and creative trio became a gaping hole and passes had to be forced through as opposed to simple lay-offs being available for the player in possession. Oscar’s ability to dribble past players and vision for an eye of a needle pass give him the ideal characteristics to create space for himself and those around him in the final third of the pitch. No one wants to see a sad Oscar. It isn’t just Oscar that poses a selection headache for Mourinho, the likes of Kevin De Bruyne, Marco van Ginkel and Romelu Lukaku will be looking to impress the manager during the pre-season and show why they should be in the starting lineup. All the more reason for the manager to experiment with the vast of array of talent that he has inherited and added to. Chelsea will be looking to avoid falling into the pit of having to rely on the trio of Mata, Hazard and Oscar this season, who possess the ability to deliver but the strain and workload began to tell at different times throughout the season. It will also be important for Mourinho to assess John Terry’s ability following his return from an injury plagued season in which the club captain didn’t look himself in the slightest. An adoption of a high line with constant intensity may not suit Terry in his ageing years as the signs of wear and tear loom over him but his ability to end up in the right place and read the game has yet to be matched by the fellow centre backs at the club. There is also the last chance saloon for a certain Fernando Torres. Still enjoying an extended holiday for his involvement in the Confederations Cup a return to former glory is all but written off, however a better striker than the one that has been seen over the past two and a half seasons is not out of the question. The squad is built for a striker to thrive. Creativity and speed in abundance behind, if Torres can find his shooting boots and make the clever runs in behind defenders that are required of him to get the best out of the midfield, the striker may well find himself keeping his job at Chelsea. A poor pre-season may signal the end of that run. A season filled with high expectation awaits and it all kicks off with Chelsea’s first game this season on July 17th (Just over a month from the opening League fixture vs Hull) a friendly against a “Singha All Star” team on Wednesday at 2pm UK time which will be available to watch on Chelsea TV.